Bihar School Education Board D.El.Ed Result 2019. Bihar School Education Board recently has announced the Result of Bihar Board D.El.Ed. Those Candidates Who had applied for this exam now they Can download their Marksheet by just reading the details given below. Click on the link as we provided below. Let’s Enter your details such as Roll number and Roll Code. Take a printout of your result for future reference. 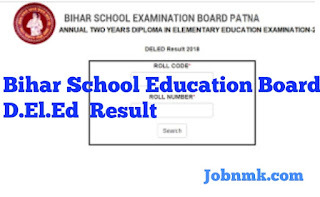 Bihar School Education Board D.El.Ed Result 2019.